The vandalism of war graves at Belfast City Cemetery has been described as "deeply distressing" by a member of the Commonwealth War Graves Commission. In total, 14 graves were damaged at the Falls Road cemetery and one headstone smashed. A "Cross of Sacrifice" war memorial was also extensively covered in graffiti. Peter Francis said the commission was working with Belfast City Council to repair the damage. Mr Francis added: "We spoke to the local authority yesterday to see about getting the cross cleaned up as quickly as possible. "Our contacts on the ground are going to inspect the headstones to see what remedies can be put in place. "Replacement headstones may take a bit longer, but we will do everything we can to expedite the process and restore the cemetery to a fitting standard." The damage was reported on Tuesday, but police said it could have happened anytime since Tuesday 15 April and have appealed for information. It happened in the area of the cemetery for war dead from both wars. Historian Tom Hartley said graves had not been damaged in the cemetery since 2002, but added: "There is low level vandalism that is constant in this cemetery. "I try to raise awareness of that but there are always a few people who are beyond the influence of any community." 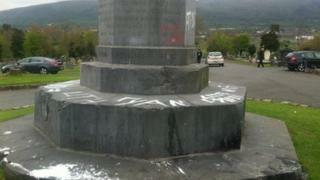 The vandalism has also been condemned by republican ex-prisoners group Coiste na nIarchimí. "These attacks are an affront to the sacrifices made by those who died in World War I and their relatives. They also offend the sense of decency among people across the local community," the group said.